With actor Vijay's Theri ending it's massive first week with flying colors at the Box Office, the cast and crew of the film couldn't be happier. 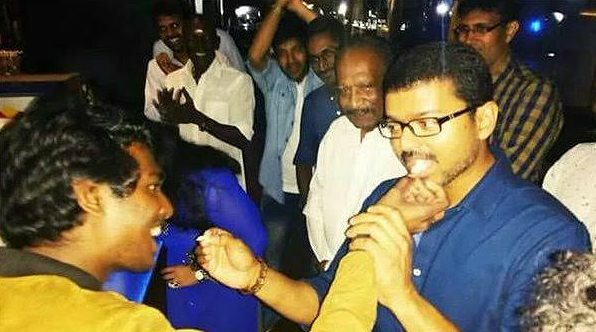 And to celebrate this Theri fervour all around, the film's team recently organised a success party at a popular luxury hotel in Chennai. The private party was organised by Atlee, the film's director. Most of the cast including actor Ilayathalapathy Vijay, producer Kalaipuli S Thanu, Mahendran, Rajendran, Baby Nainika, Meena attended the success bash. However, the leading actress of the film, Samantha Ruth Prabhu, was missing. The Theri success cake was cut jointly by Atlee, Vijay and Thanu. The film has done remarkably well in India as well as the overseas market. It has raked in Rs 85 crore worldwide and is inching towards the coveted Rs 100 crore mark. Theri has broken records set by Baahubali and I in South India. The Vijay-starrer has broken the 4-day records of Bahubali: The Beginning and his own films Kaththi and Puli at the Chennai Box Office. In Kerala, Theri has become the all time highest opening weekend film by beating Shankar's I's record. Theri is a 2016 Indian Tamil-language action film written and directed by Atlee and produced by Kalaipuli S. Thanu. The film features Vijay, Samantha Ruth Prabhu and Amy Jackson in the lead roles, while Mahendran, Prabhu and Raadhika Sarathkumar amongst others form an ensemble cast. Featuring music composed by G. V. Prakash Kumar and cinematography handled by George C. Williams.